Because we live in the future and we also love coffee and donuts, Google Assistant once again makes your life easier. Dunkin Donuts has enabled the ability to place orders at your local store through Google Assistant. Everyone say donuts in your Homer Simpson voice. How it works is similar to other Actions within Google Assistant. 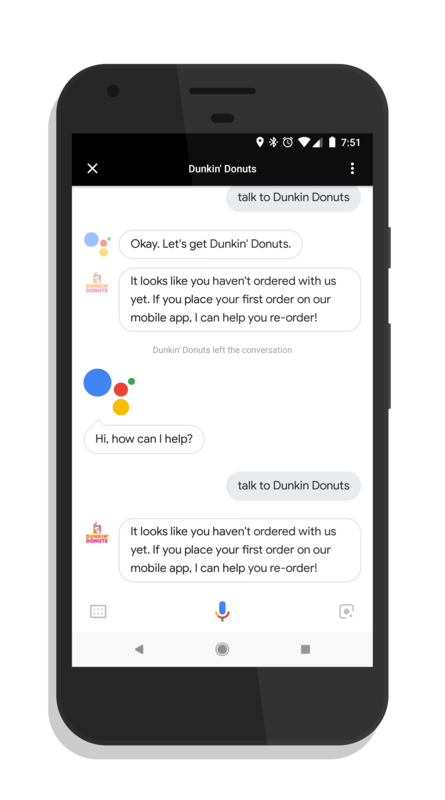 First, you will need to have linked your Dunkin Donuts Perks account to Google Assistant, which you will be prompted to do the first time you say, “Hey Google, talk to Dunkin Donuts”. After your card is linked, you can choose your pick up location and you can select something from your recent orders. Once done, you can confirm the order and then go pick it up at your local Dunkin location. Now, in order for this to work, you have had to have place an order through the Dunkin mobile app in the past. It won’t let you create a brand new order which, to be fair, is a pretty common thing on these type of Actions. These types of interactions with Google Assistant continue to grow in number, all with the aim of allowing you to make purchases or get information without having to even have the app installed for that company. If you have a Dunkin Donuts nearby, give this new interaction a try and see how it works for you. And enjoy your donut and coffee.